BLUEBONE began as four musicians that defied the labels and the hype to play hard-hitting music of their own. The band has grown into a family- a movement- of music from the heart to the heart. It doesn't seem to matter which of the BLUEBONE alumni are back to perform, or which new folks enter the family, BLUEBONE is ALWAYS about the most earnest, heart-felt performance. From family to fans to friends to the band, BLUEBONE is first and foremost, the most honest, intense, and emotional music you will find anywhere. Each BLUEBONE performer has roughly thirty years experience playing live, and they have come together to make a statement. Refusing to fit into an industry mold, they play a variety of guitar driven, contemporary blues and blues rock that is artful and inspired. Their sound is tight, emotional, and often hard-hitting, as they perform thier repetoire of both originals and cover tunes. Bluebone originals can be sampled on their fine cds. Their debut, "Bluebone" is a collection of great original songs. "Live @ Cape May" is a snapshot of this powerful band at their best- live. "We The People" is a release of two songs that shouldn't be missed. "RADIO", their latest release(April 2005), is their best recorded work yet, with powerful, driving songs. A list of Bluebone cover songs includes material by BB, Freddie, and Albert King, Eric Clapton, Stevie Ray Vaughn, Tommy Castro, Fats Domino, Willie Dixon, Bo Diddley, Jimi Hendrix, Big Bill Broonzy, Ike Turner, and many more. Bluebone has received airlplay on many radio stations, including Cadillac Blues with the Commander on WLVR, WRDV FM, and Jonny Meister's Blues Show on WXPN Philadelphia. They have also recieved enthusiastic reviews of their cd in national publications such as Blues Review Magazine and Blues Access Magazine. Other favorable reviews have come from regional publications, including At The Shore Magazine and the Montgomery County TICKET, as well as the Jersey Shore Jazz & Blues Foundation and Oklahoma Blues Society newsletters. 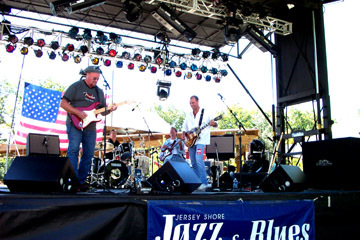 Recently Bluebone was mentioned in a New York Times article as one of the few, top-notch blues bands operating out of New Jersey. As a group, Bluebone boasts over 120 years of live performance experience playing various kinds of music. Bluebone has shared the stage or played on the same bill with Carl Weathersby, Georgie Bonds, Heather Hardy, Roomful of Blues, Son Seals, Frank Bey, Miss E.C. Scott, Archie Jenkins, Eddie Clearwater, Steve Jankowski, George Mesterhazy, Levon Helm, Sweet Georgie Brown, and Shemeika Copeland. They believe that blues are the basis of nearly everything they have played in the past, and they bring those various flavors back home- to the blues. They know how to play, and they play what they love. Bluebone is associated with ASCAP.